The Valentine couples in the scene above has been greatly reduced. Not all are shown. Cute couples in a variety of poses for Valentine’s Day. A huge collection of couple graphics for your romantic designs. 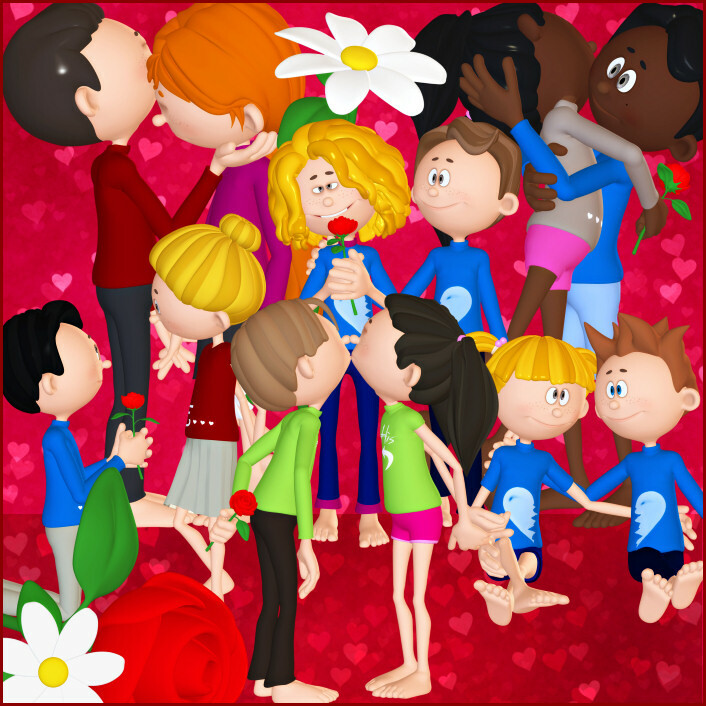 Celebrate true love with this cute collection of Be Mine Graphics, which features romantic toon couples. These couples are in fun, romantic poses. Many express their love with red roses or a daisy. They’ll be the perfect addition to your Valentine’s Day or romance designs. An African version of each couple is included along with some single roses and daisies. The size of these images varies, but they’re approximately 1400 X 2000 pixels. All are 300 DPI, making them great for print projects. Members can use the tubes for personal or commercial projects, including web design, template design, graphic design, t-shirt design, candy wrappers, scrapbook projects, signature tags, and much more, but please read my terms to learn more. If you have any questions, please email me. This package is one zip file which is approximately 39 MB.